If you have recently been into our office, we may have discussed a new anti-reflective coating that protects your eyes from a percentage of the blue light emitted from electronic devices and fluorescent lights. 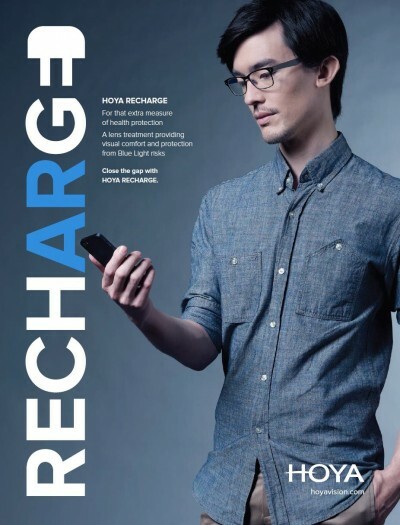 Hoya’s Recharge EX3 anti-reflective coating reduces eye strain and headaches associated with computer use as well as providing the same benefits as the anti-reflective coating that we’ve always recommended: reduced glare from electronic devices and while driving at night, scratch resistance and a 2 year warranty on the lenses. There has been a dramatic increase in the number of diagnosed cases of macular degeneration and that number is expected to continue to grow. Macular degeneration is most often related with age; however, studies have shown that blue light speeds up the deterioration of the tissues of the macula and it is expected that more and more people are going to be diagnosed at younger ages in the future. The macula is located in the central area of the retina and is responsible for your vision when looking straightforward and your ability to distinguish colors. Macular degeneration occurs as the tissues in the macula begin to weaken and breakdown and there is no known cure for the most common form of it. There are typically no warning signs in the early stages of macular degeneration, which is why a yearly eye exam is so important even if you feel your vision has not changed.